Trees on agricultural landscape play a vital role in ecosystem services including food security that supports human livelihood. They can further offer synergy between adaptation and mitigation in addressing climate change impact. Understanding aboveground tree biomass and soil organic carbon stocks along the altitudinal gradient provide opportunities for better management of the carbon pools. However, little is known on how altitudinal gradient influences on carbon stock of woody biomass and soil of scattered trees on farmland, particularly in a dry area. The study area were stratified in to five class (500–1000, 1000–1500, 1500–2000, 2000–2500, and 2500–3000 m a.s.l). Quadrats (100 m × 50 m) were randomly selected from each of stratified altitudinal gradients. At every sampling point, one composite soil sample was taken at 60 cm soil depth for soil organic carbon analysis. For the purpose of woody biomass estimation, allometric equations developed for a similar area were used. Finally, aboveground biomass carbon (AGC), belowground biomass carbon (BGC), soil organic carbon (SOC), and total carbon stock (TC) status were estimated and variables were compared using one-way analysis of variance (ANOVA). The result indicated that AGC, BGC, SOC, and TC varied significantly (p < 0.05) along with an altitudinal gradient. The upper altitude (2500–3000 m a.s.l) AGC, BGC, SOC, and TC stock was estimated as 17.97 Mg C ha−1, 6.53 Mg C ha−1, 23.09 Mg C ha−1, 47.59 Mg C ha−1 respectively, and significantly higher than the other altitudinal gradient. We conclude that scattered trees on farmland hold a high potential of carbon storage which may greatly contribute to the climate resilience green economy strategy and their conservation should be promoted. Tree cover on agricultural landscape is variable globally. The tree cover is 10%, 20%, and 50% in the 46%, 27%, and 7.5% cover of cultivated land respectively (Zomer et al. 2009). Trees are an essential part and a common feature of many agricultural landscapes, where they provide a range of ecosystem services that support livelihoods. In Ethiopia, these scattered trees occurred in different land use systems such as in the communal land, coffee plantations, crop fields, and along roadsides (Teklay 2005). Some of these trees were left when the natural forest was converted to other land use system; others regenerated after the land was cleared or were actively planted by farmers. For example, parkland agroforestry in the farmland of Northern Ethiopia often contain a local momona species (Faidherbia albida (Del.) A. Chev.) because farmers plant or maintain this species to provide soil quality and productivity (Teklay 2005). Farmers are growing and maintain trees on their agricultural land for different variety of products and services (Kuyah et al. 2016), and manage a mix of exotic and indigenous trees in different ways (Nyaga et al. 2015). The major productive services of trees such as lumber, plywood, fuelwood, or charcoal come from the wood of trees (Young 1997), food, medicines, feed/fodder for livestock, and natural gums (Kuyah et al. 2016). The major protective or ecosystem services of trees on farmlands are to the harbor for birds and insects (Scherr and McNeely 2008), improve soil fertility, and serve to conserve soil and water (Barrios et al. 2012). Tree on the agricultural landscape is also important in enhancing farmers’ adaptive capacity and reducing the susceptibility of farming systems to climate change impacts (Boye and Albrecht 2005). In addition, trees provide a wide range of environmental benefits such as control of erosion and storing a significant amount of carbon on both above and below ground in the form of soil organic carbon. Therefore, trees on farmland must be included in the climate change programs and policies such as Reducing Emissions from Deforestation and Forest Degradation (REDD+). However, the potential of trees on farmlands to sequester carbon depends upon the woody species composition, ages of trees, geographic location, agroecological conditions (climate, altitude, and wind), management regimes, and soil characteristics (Bunker et al. 2005; Henry et al. 2009; Newaj et al. 2016). Most studies indicated that even if trees on farmland or agricultural landscape are not primarily designed to sequester carbon, it is a unique opportunity to increase carbon stocks in the terrestrial biosphere (Albrecht and Kandji 2003). Tree on farmland contains less carbon than primary or managed forests but they contain significantly higher carbon stocks than annual crops (Henry et al. 2009). Studies suggested that the integration and proper management of trees on farmland has a great potential to sequester carbon from the atmosphere, in addition, to rehabilitate degraded land and to improve the livelihood of the rural communities. 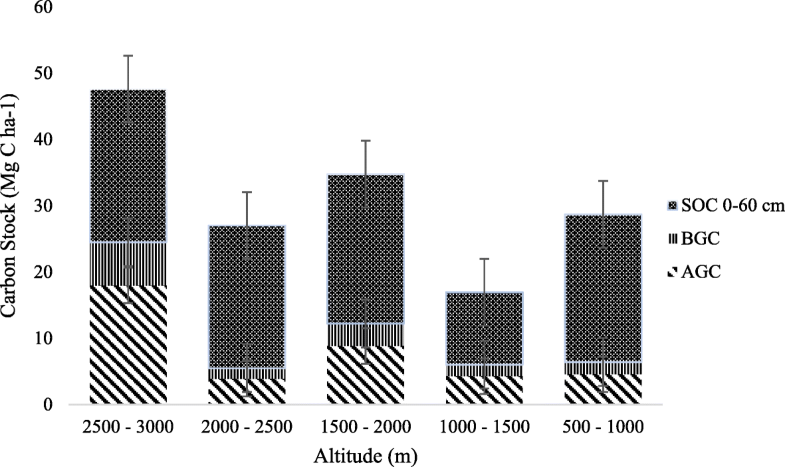 However, altitudinal gradients are among the most powerful “natural experiments” for testing ecological responses of biota to environmental changes (Körner 2007). Similarly, Leuschner et al. (2007) and Zhu et al. (2010) reported that altitude has a significant influence on biomass and soil carbon stock potential of these tree on farmland. The study aimed to quantify and compare the woody biomass carbon and soil organic carbon potential of trees on farmland along an altitudinal gradient. This study focuses on two related questions: (1) is there any significant variation in above- and belowground biomass carbon stocks along with an altitudinal gradient of scattered trees on farmlands? 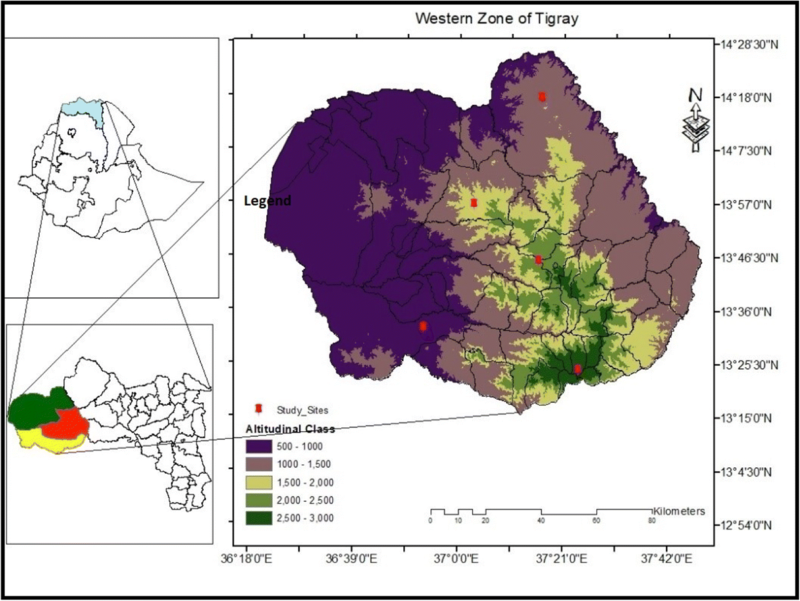 (2) Is there any significant variation in soil organic carbon stock along with an altitudinal gradient of scattered trees on farmlands of the Western Zone Tigray, Ethiopia? The study was carried out in the Western administrative zone of the Tigray region, Northern Ethiopia (13° 42′ to 14° 28′ North Latitude and 36° 23′ to 37° 31′ East Longitude) (Fig. 1). The study site is comprised of trees on the agricultural landscape that occupies lower, middle, and upper altitude gradients. Lowland is categorized into two zones namely 500–1000 m a.s.l and 1000–1500 m a.s.l, middle land is categorized into two zones namely 1500–2000 m a.s.l and 2000–2500 m a.s.l, and upper latitude is categorized into one zone namely 2500–3000 m a.s.l. The total land area of the western zone of Tigray is 1.5 million ha. The western zone of Tigray is one of the less densely populated areas in Ethiopia, with an average density of 33 person km−2. The elevation ranges from 500 to 3000 m a.s.l. and the annual rainfall for the zone ranges from 609 to 2316 mm and mean annual temperature ranges (min and max) from 27 to 45 °C and 10 to 22 °C. A range of soil types are found, but the dominant soil types are Vertisols, Luvisols, and Cambisols. The farming is carried out to meet household needs and to derive cash. Mechanized agriculture is practised in the lower altitude. The dominant farming is a mixed crop-livestock farming system solely managed by family labor. The total cultivated area is 573,285 ha (38.2%) (Table 1). Pterocarpus leucens, Ziziphus spinachristi and Combretum sp. The study site was stratified into the following altitudinal gradients: 500–1000 m, 1000–1500 m, 1500–2000 m, 2000–2500 m, and 2500–3000 m above sea level based on the Ethiopian Agroecological (Hurni 1998) Zones. The Advanced Spaceborne Thermal Emission and Reflection Radiometer Digital Elevation Model (ASTER-DEM), 30 × 30 m resolution supported by global positioning system (GPS) points were used to classify the gradient. The classification was done in Arc GIS Version 10 software. Inventory of scattered tree on farmlands was conducted from randomly selected rectangular seventy-five (75) plot of 100 m × 50 m (Nikiema 2005) along five altitudinal gradients. Rectangular plots were chosen as they tend to include more of the within-plot heterogeneity and more representative than square or circular plots of the same area (Hairiah et al. 2001). Trees and/or shrubs ≥ 5 cm in DBH, DSH, and height were measured using a diameter tape, diameter caliper (Ponce-Hernandez et al. 2004), and Suunto hypsometer respectively. Woody plants which have multiple stems above 1.3 m height were considered as a single plant and woody plants with multiple stems or fork below 1.3 m height were measured each individual stem. Plant identification was done in the field using their local name and useful trees and shrubs for Ethiopia (Bekele-Tesemma and Tengnäs 2007) and Eritrea (Bein et al. 1996). Soil samples were taken from four corners and center of the 0.5 ha rectangular plot using “X” pattern at a 60 cm soil depth (Negash and Starr 2015) and composited to make one representative sample for each quadrant for analysis of soil organic carbon. In addition, from the same quadrant, soil samples for soil bulk density determination were collected using 10 cm length and 3.4 cm diameter core sampler carefully driven into the soil to avoid compaction (Roshetko et al. 2002). In total, 75 disturbed soil samples and 375 non-disturbed soil samples were taken using auger and core sampler. Biomass carbon stocks for each plot (Mg C ha−1) were calculated as the product of dry matter biomass and carbon content. Trees and shrub plant biomass were calculated using the plot inventory data and allometric biomass functions. The allometric equation developed by Eq. 1 (Kuyah et al. 2012a) was used to estimate the aboveground biomass (stem plus bark, branches, and foliage) of the trees and/or shrubs. This equation was selected as it was appropriate to estimate a wide range of parameters ranging from DBH or height to aboveground biomass (Kuyah et al. 2012a) with the lowest prediction error value. Moreover, this equation is developed for trees grown in agroforestry and DBH greater than 2.5 cm. Besides, this equation was developed in areas having similar environmental conditions (climate and soils) in the study area. Where AGB is the estimation of the aboveground biomass (kg dry matter/plant) and DBH is the diameter (cm) at breast height (1.3 m). Species-specific allometric equations were also used for estimating above-ground biomasses for trees and shrubs on farmland (Table 2). Then the tree biomass was converted into carbon by using Eq. 2 (MacDicken 1997; Brown 2002). Belowground biomass was estimated following Eq. 3 developed by Kuyah et al. (2012b). This equation was selected for its easiness to apply, less time consuming, and is non-destructive. It estimates belowground biomass carbon (BGC) through a relationship to aboveground biomass. The belowground biomass was estimated following Eq. 3. Where BGB is belowground biomass and AGB is aboveground biomass. Where C is the soil organic carbon concentration determined in laboratory (g kg1), ρ is the bulk density (g cm−3), d is the soil depth of sampled soil layer (cm), and frag is % volume of coarse fragments/100. Where TC is total carbon, AGC is aboveground carbon, BGC is belowground carbon, and SOC is soil organic carbon. Data collected from field inventory was organized and recorded in Microsoft Excel 2016 data sheet. The estimated AGB, AGC, BGB, and BGC data were subjected to log transformation [log (n)] before statistical analysis to meet the assumption of normal distribution. Both vegetation and soil data were analyzed using univariate analysis. Variables were compared using one-way analysis of variance (ANOVA) at P < 0.05 with the help of the R software for Window versions 3.4.3. Whenever statistical difference existed, it was subjected to Tukey’s HSD test to separate the means. There was a strong variation in the mean aboveground carbon stock between the tree on farmland (Table 3). The upper altitude (2500–3000 m a.s.l) of the scattered tree on farmland had higher AGC by 21.63% as compared to the 2000–2500 m a.s.l. The observed variation in mean AGC along altitudinal gradients was significant (F = 6.1504, p < 0.001). The pattern of variation in belowground carbon (BGC) among altitudinal ranges was similar to that of AGC for scattered trees on farmland (Table 3; Fig. 2). The highest BGC was found in the 2500–3000 m altitudinal class (6.53 Mg C ha−1) followed by 1500–2000 m altitudinal class (3.39 Mg C ha−1). The variation of BGC of the scattered tree on farmland along the altitudinal gradient was statistically significant (F = 6.1168, P < 0.001). The mean SOC stocks by the altitudinal gradient of the scattered tree on farmland were variable (Table 3; Fig. 2). Similar to biomass carbon stocks, mean SOC stocks were the highest for the 2500–3000 m a.s.l (47.59 Mg C ha−1) and the lowest for the 1000–1500 m a.s.l (10.91 Mg C ha−1). However, similar to our hypothesis, the differences between altitudinal gradient mean SOC stock values were great and significantly different (F = 8.234, P < 0.001) (Table 3). The proportion of total biomass carbon to the total carbon stock was averaged 35% for all altitudinal gradient. We hypothesized that carbon stocks would significantly differ between altitudinal gradient, and the differences were found to be significant (Table 3). However, biomass carbon stocks were dominated (> 50%) by tree biomass. Mean carbon stocks did significantly differ between the altitudinal gradient (F = 10.225, P < 0.001), as we had hypothesized. The highest total carbon stock density scores in 2500–3000 m a.s.l (47.59 Mg C ha−1) and the lowest in the 1000–1500 m a.s.l (16.93 Mg C ha−1). Biomass carbon stock of scattered tree on farmland showed that there is significant variation along an altitudinal gradient. Our result contradicts with the findings from Leuschner et al. (2007) and Zhu et al. (2010) who reported that above- and belowground tree biomass and its carbon stock decline with an increase in altitude. The increasing biomass carbon with altitude in the current study may be attributed to disturbance and diameter class distribution. The lower altitudinal gradient of the study area is highly influenced by the local people through cultivable land expansion and procuring essential forest products which is probably the cause for the lower biomass at lower elevations. On the other hand, the presence of species characterized by large individuals and also posibly due to the favorable conditions for tree growth in the upper altitude, because few large individuals can account for the large amount of above and below ground carbon (Rahayu et al. 2005). This is probably the case in the present study area, where bigger trees with maximum DBH were more frequent at higher altitudes. Total biomass carbon ranges from 1.07 to 209.41 Mg C ha−1 among altitudinal gradients. Therefore, this result was within the range reported at a global scale. Agroforestry system stores 12 to 228 Mg C ha−1 (Dixon 1995), deciduous forests and savannas in Brazil also store 6–24 Mg c ha−1 (Silva et al. 2013), for trees used in the various systems Sub-Saharan Africa stores 7–28 Mg C ha−1 (Unruh et al. 1993), and for the humid tropical Africa for Agrosilvicutural agroforestry System stores 29–53 Mg C ha−1 (Albrecht and Kandji 2003). However, biomass carbon stock values were lower than reported for traditional agroforestry systems in the tropics reported 145 Mg C ha−1 (Kirby and Potvin 2007), smallholder agroforestry system in the tropics which ranges 228–246 Mg C ha−1 (Roshetko et al. 2007), and smallholder cacao (Theobroma cacao Linn.) based agroforestry systems in western and central Africa stores 152.2 Mg C ha−1 (Duguma et al. 2001). SOC plays a vital role in the global carbon cycle, forming large carbon pools with long residence times (Post et al. 1982). The SOC stocks scattered trees on the farm of the study area ranged between 2.28 and 40.5 Mg C ha−1 are noticeably lower compared to the SOC stocks of other ecosystems and soils. The SOC stock at 60 cm layer for tropical forest, tropical savannah, and tropical agricultural land has been reported to be 121–123 Mg C ha−1, 110–117 Mg C ha−1, and 80–103 Mg C ha−1 respectively (Lal 2004), for agroforestry-based crop production of semi-arid areas of Northern Ethiopia stores 25.8 Mg C ha−1 (Gelaw et al. 2014), for semi-arid Acacia woodland in southern Ethiopia stores 42.9 Mg C ha−1 (Lemenih and Itanna 2004), and for agrisilviculture agroforestry systems of India stores 27.4 Mg C ha−1 (Swamy and Puri 2005) and for tropical soils estimates 86 Mg C ha−1 (Brown and Lugo 1982). But, significantly higher than the rainfed crop production of semi-arid areas in Northern Ethiopia stores 16.1 Mg C ha−1 (Gelaw et al. 2014). SOC stocks of the study area were also within the ranges of those reported for cultivated and grazing land of East and West Africa 18.5–52.5 Mg C ha−1 and 22.4–54.0 Mg C ha−1 respectively (Brown et al. 2012), and for traditional agroforestry practiced in southern Ethiopia ranges 28.2–98.9 Mg ha−1 (Demessie et al. 2013). SOC stocks in the soils studied showed significant variations with altitude. This could be due to more or less difference in vegetation structure and diversity through all elevation gradient, which may accumulate the different amount of organic matter due to high inputs from root biomass and aboveground. Various studies indicate that soil carbon stocks increase with elevation in mountainous areas (Bolstad et al. 2001). It can also be attributed to the soils in cooler climates usually contain more organic matter due to slower mineralization rates and soil organic matter (SOM) accumulation increases with increasing precipitation. Differences along vegetation gradients reflect a changing balance of soil carbon inputs and soil carbon losses that are related to changes in both abiotic (temperature, precipitation, potential evapotranspiration) and biotic (litter quality) factors (Lal 2004; Garten and Hanson 2006). The low levels of SOC in the 1000–1500 m a.s.l altitudinal gradient imply an effect on soil physical and chemical characteristics, soil fertility status, and biological activities (Weil and Brady 2002). Therefore, a low level of SOC in 1000–1500 m a.s.l affects crop productivity when we compare with the other altitudinal gradient class. Cultivated area management such as crop residue retention and crop rotation contribute to improving SOC stocks (Raffa et al. 2015), and these strategies could be utilized in the 1000–1500 m a.s.l altitudinal areas to enhance crop productivity. The distribution of carbon stocks between biomass and soil differs among ecosystems and varies with an altitudinal gradient. The total carbon stocks (biomass carbon + soil carbon) of the study area scattered trees on farmland (2.67–89.62 Mg C ha−1 and averaging 31 Mg C ha−1) were within the range to that of tropical agroforestry 7.9–105 Mg C ha−1 (Montagnini and Nair 2004), traditional agroforestry system of humid sub tropical ranges 10.29–31.86 Mg C ha−1 (Yadava 2010), and Cocoa-based agroforestry practiced in Nigeria that ranged 16–96.01 Mg C ha−1 (Oke and Olatiilu 2011). The difference in carbon stock could be attributed due to farm size, management, socio-economic needs, species diversity, the age of trees, local climate, and tree spacing among agroforestry system (Kumar 2011) and higher levels of disturbance (pruning and damage), intensive management practices, and small land size that forces scattered trees on farmland not only having a higher density of wood perennials but also an accumulation of other plants and crops per unit area. The scattered trees on the farmland of the semi-arid area of western Tigray in Ethiopia are not only for crop production and soil and water conservation but also contributed to adapt the changing climate by providing provisioning, supporting and regulating services. However, there is a total of 31 Mg C ha−1, which suggests that the significant potential of these production systems to store and enhance ecosystem carbon stocks. This could be an attractive opportunity for farmers to benefit economically from scattered trees on farmland if the carbon sequestered is sold to developed countries. The total carbon produced from the upper altitudinal gradient is higher than that of other altitudinal gradient class, highlighting that the elevation gradient can actively influence carbon stock accumulation on farmland. Biomass carbon stocks were significantly less than the SOC stocks in almost all altitudinal gradient class. Scattered trees on farmland in the study area were large potential in carbon sinks. However, illegal exploitations and unmanaged grazing have threatened the system. Hence, this calls for an integrated action to control the problem. The authors acknowledge the financial support from Tigray Agricultural Research Institute (Humera Agricultural Research Center) and technical support from Mekelle University. We are grateful to the two anonymous referees for constructive comments on an earlier version of this manuscript. YG, TG, and EB designed the study. YG conducted the laboratory experiment. YG and EB analyzed the data. YG, TG, KT, and EB wrote the manuscript. All authors read and approved the final manuscript. Brown S, Grais A, Ambagis S, Pearson T (2012) Baseline GHG emissions from the agricultural sector and mitigation potential in countries of East and West Africa. CCAFS Working Paper 13. Copenhagen, Denmark: CCAFS https://ccafs.cgiar.org/publications/baseline-ghg-emissions-agricultural-sector-and-mitigation-potential-countries-east-and#.XAYmG-9LHoE. Accessed 13 Mar 2018.